The storm destroyed crops and fruit in five villages. 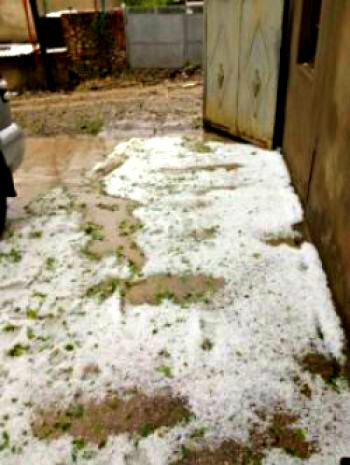 TBILISI, DFWatch–A strong hailstorm hit Georgia’s eastern Kakheti region Monday, almost completely destroying fruits and crops in five villages. Giorgi Sibashvili, former Deputy Governor of Kakheti, told Interpressnews that hail has destroyed agricultural lands in the village Vejini, close to Gurjaani. The hailstorm lasted just a few minutes, he said. The storm was followed by strong rain which damaged the roads in the village. According to local reporters, there is restrictions on traffic from Tbilisi to Gurjaani and Telavi, two towns in the Kakheti region, due to the storm. A river flooded the village Dzirkoki. The flood damaged the highway and caused problems for traffic, while almost 100 percent of the harvest has been destroyed, as reported by a correspondent for Pirveli Radio. Some of the villages still have no electricity, as cearance work is in progress. The hail destroyed fruits, vegetables and vineyard in the village Bakurtsikhe. Netgazeti.ge quotes Joni Osiashvili, Gamgebeli of Gurjaani, saying that the harvest is almost 100 percent destroyed in four villages – Bakurtsikhe, Vejini, Kardenakhi and Kolagi. Roads are flooded, as well as first floors of private houses. http://www.youtube.com/watch?feature=player_embedded&v=v2GyqOBCksA one of the locals uploaded video of storm on Facebook.